Gibraltar is releasing two very exclusive, limited edition Gibraltar gold coin struck in 22 carat fine gold to commemorate Her Majesty Queen Elizabeth II 65th Anniversary of the Coronation. The edition is limited to 65 coins, one for each year of since her coronation. To commemorate the 65 years of the Coronation, Gibraltar is producing a 22 carat gold five sovereign limited edition coin and a 22 carat gold one sovereign limited edition coin. It has been many years since a 1 sovereign gold coin has not been made available in Gibraltar. Only 65 coins are being produced of each, one for each anniversary year. The coins issued on the actual coronation date will be offered to collectors and investors worldwide as from today. The quality of the gold coin combined with its limited worldwide mintage, its historic anniversary and its gold content will make this a one of the most magnificent bullion coins available in the market. 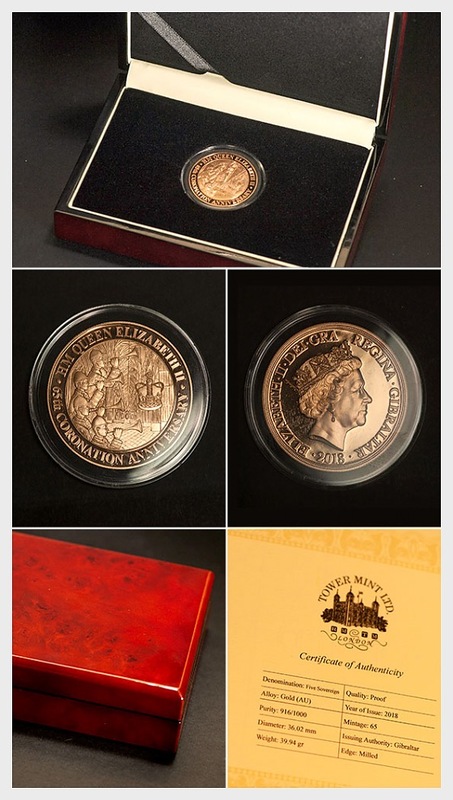 The 5 sovereign coins are priced at £1,895 and the 1 sovereign coins are priced at £395. Both are sold inside a secure capsule within a beautiful luxury presentation box that includes a signed certificate of authenticity with the edition limit. In keeping with the traditions of sovereign coins since 1489, the obverse design includes Latin inscription and sizes. The Sovereign coin design does not include a denominational value as each coin is determined by its diameter. The design depicts Queen’s effigy, previously used on the Gibraltar coinage. The reverse design depicts specifically made engraving for the coins featuring Westminster Abbey, Coronation Crown and the trumpeters. The traditionalcoronation crown is known as St. Edward's Crown. The monarchs crowned with St. Edward's Crown were Charles II (1661), James II (1685), William III (1689), George V (1911), George VI (1937) and Elizabeth II (1953). Coins will be sold on a first come first serve basis.